472 pages | 180 B/W Illus. Interest in anaerobic digestion (AD), the process of energy production through the production of biogas, has increased rapidly in recent years. Agricultural and other organic waste are important substrates that can be treated by AD. 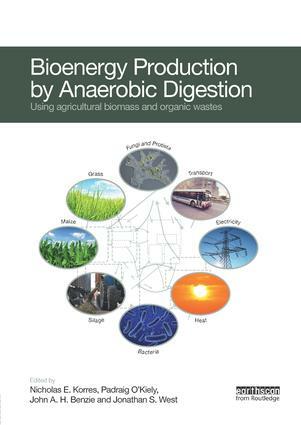 This book is one of the first to provide a broad introduction to anaerobic digestion and its potential to turn agricultural crops or crop residues, animal and other organic waste, into biomethane. The substrates used can include any non-woody materials, including grass and maize silage, seaweeds, municipal and industrial wastes. These are all systematically reviewed in terms of their suitability from a biological, technical and economic perspective. In the past the technical competence and high capital investment required for industrial-scale anaerobic digesters has limited their uptake, but the authors show that recent advances have made smaller-scale systems more viable through a greater understanding of optimising bacterial metabolism and productivity. Broader issues such as life cycle assessment and energy policies to promote AD are also discussed. Nicholas E. Korres is a researcher at the University of Arkansas, USA. Padraig O’Kiely works at Teagasc, the Irish Agricultural Authority, Ireland. John A.H. Benzie is a Professor in the Environmental Research Institute at University College Cork, Ireland. Jonathan S. West is a senior scientist at Rothamsted Research, Harpenden, UK.